Ukraine's TV, print media and vibrant Facebook community are abuzz with reports a “roaming tank” is on the loose, destroying the vehicles of those involved in smuggling goods from the country’s mainland into the eastern regions controlled by pro-Russian separatists. There is even a hashtag devoted to the mystery tank –#блуждающийтанк; which, translated, means #roamingtank. Asked about the “roaming tank,” Yuri Biriukov, an adviser to President Petro Poroshenko who is playing a prominent role in Ukraine's efforts to curb the illegal flow of supplies to the separatist-controlled territories, said that the “roaming tank” is not operated by government forces, but acting on its own..
"Smuggling food here is just as lucrative as drug trafficking," said Biriukov, who spoke to VOA while on a mission in eastern Ukraine. He said dozens of heavy trucks headed toward the separatist-controlled areas are intercepted every day. One can legally do business with the so-called “occupied territories” in the east, but smugglers circumvent cumbersome legal procedures and opt to deliver goods clandestinely. They take loaded trucks around the military checkpoints on the line separating the two sides - or through them, bribing soldiers in the process. Smugglers often carry items easy to obtain in Ukraine that sell at a premium in the war-torn Donbas region. For instance, residents of the rebel-controlled town of Shakhtyorsk complain online that one kilogram of chicken breast can cost as much as 110 Ukrainian hryvnias ($5), while a kilo of butter can cost around 140 hryvnias (over $6). In the capital Kyiv, a kilo of chicken breast is 55 hryvnias ($2) and a kilo of butter is 60 hryvnias (less than $3). The median income in Ukraine, estimated at $162 per month in May, is even lower in the separatist-controlled areas. The Donbas was once Ukraine's industrial heartland, but big businesses and manufacturers abandoned the region after fighting between the Russia-backed separatists and government forces broke out last year. "If smugglers made it past military checkpoints, they paid bribes," Roman Donik, a Ukrainian volunteer taking part in an anti-smuggling campaign, told VOA in a phone interview. Donik said that some soldiers find it hard to resist taking bribes even though some are paid up to $500 per month, which is high by Ukrainian standards. "Court-martialing corrupt soldiers would seem appropriate,” he said. “But we're aware that the main problem here is soldiers' low motivation, because of how poor they are." 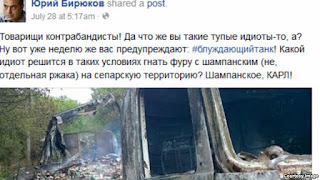 Ukrainian officials appear to be resorting to scare tactics aimed at instilling fear in both smugglers and corrupt soldiers, including the “roaming tank” reports. Photographs of the smoldering wreckage of smugglers’ vehicles have been posted on Facebook by members of the military and volunteers from groups working with the army in various capacities. Biriukov appears to be one of those pushing the "roaming tank" story. "The roaming tank will keep blowing up your vehicles all the time,” he wrote in a recent Facebook post. “Do you get me, scum? I mean all the time!" He has, however, consistently denied that tanks operated by government forces have blown up smugglers’ vehicles. On one occasion, the presidential adviser told VOA that it was the separatists who were firing on vehicles entering their territory; on another, he urged VOA to ask Ukrainian tank crews what was going on. Volunteer Roman Donik was also reluctant to say that the Ukrainian military was responsible for blowing up smugglers’ vehicles. Still, he spoke favorably about the “roaming tank” attacks and insisted that they have not caused any human casualties. "So far it's only vehicles that suffer,” he told VOA. “Miraculously." Biriukov’s Facebook posts have offered a glimpse into what the campaign against smuggling actually looks like on the ground. Distrustful of local officials and even troops stationed on the front lines of the conflict in eastern Ukraine, Kyiv relies on a task force made up of high-level personnel from the police, special services and prosecutor general’s office, who patrol troubled areas and ambush smugglers. According to Biriukov, when large shipments are seized, local government and law enforcement officials often show up to try to get the goods back – his implication being that the local officials were in on the smuggling operation to begin with. When this happens, the local officials are arrested, and sometimes, in a show of force, the intercepted rigs are blown up, Biriukov wrote. “Roaming tank” – truth or fiction? Donik said he is aware some of the methods used to stop smuggling and dissuade the military from taking bribes are far from legal. "We are trying to fight smuggling with all tools at hand and we are using legal methods as much as possible," he told VOA. "When laws don't work there has to be some sort of justice after all." Online, the stories about the destruction of smugglers trucks are mostly cheered. Some observers, however, believe the stories are exaggerated. 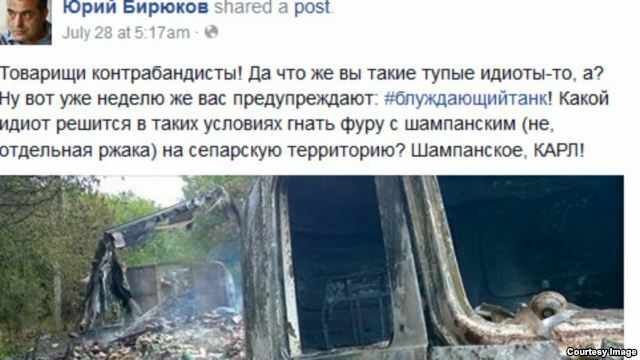 "If anyone on the Ukrainian side of the conflict was really blowing up smugglers’ trucks, this person would be investigated, rejected by Ukrainian society, then lose their job and probably end up in jail," a representative of a prominent Ukrainian human rights watchdog group told VOA on the condition of anonymity. He also pointed out that the line of separation between government and separatist forces, where trucks are stopped by the Ukrainian military, is within the reach of both sides’ weapons. Biriukov and others in the government might be eager to use the attacks on smugglers’ vehicles that have occurred to boost their own credentials and scare smugglers, the rights activist said. He added that Ukrainian media might be too unscrupulous to weed out misinformation. Leonid Emets, first deputy head of the Ukrainian parliament's justice committee, also said he thought the "roaming tank" stories were based on myths, and told VOA that smuggling must be confronted using vigorous but legal means. "It's the duty of every law-obeying, conscious citizen to use all legal means available to stop smuggling when he or she encounters it," he said. "But if someone is using methods that are outside of the scope of legal means granted to a citizen, such a citizen should be held accountable." Emets said Ukraine's power structures should work jointly both to stop smuggling and punish military or law enforcement officers who enable it. "Culprits should be punished immediately and with full weight of the law," he said.